Okay, I have a question to ask you. And I need you to be completely honest with me, no matter how painful this might be. I have to admit that I’m more than a little bit worried about the answer. But you must know I can take it. I really am a strong, stable person inside. So, really, whatever the outcome is, just be truthful and we can move forward together. What time do I have to get up this Friday to watch the dang royal wedding? Heat a medium skillet with the oil over medium-high heat. Add the sausage and saute about 3 minutes, browning them up. Add the onions and cook until they soften, maybe 5 minutes. Add the garlic and saute for 30 seconds. Toss in the oregano, pepper and tomatoes. Bring to a boil, reduce heat and simmer about 15 minutes. Add the collards, spinach and 1/4 cup of the basil. Cook maybe 2 more minutes, wilting the greens. Season with salt and pepper. In the meantime, bring the broth and water to a boil. Stir in the polenta, reduce heat and simmer 5 minutes, whisking constantly, until it thickens. Add 1/2 the cheese and stir to combine. 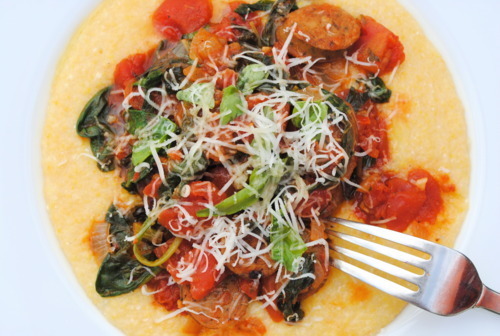 Serve a good dollop of polenta topped with the spicy sausage sauce, more cheese and another sprinkle of basil! I can’t believe I’m this excited to wake up before 5am and open a can of baked beans.